Green IT: Save the environment or the bottom-line? 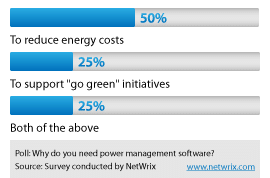 This month’s download poll results from the NetWrix Workstation Power Saving Manager revealed half were simply interested in saving the bottom-line. Utility costs have been on the rise for more than a decade now forcing vendors, and businesses alike to build and implement hardware that consume less electricity than their predecessors. Long gone are the days of leaving workstations on over the weekend or holidays. More and more organizations are looking to their utility bills to help save money. The term ‘Green IT’ is often a misnomer. It simply does not consistently reflect the underlying need as shown in the results of this poll. While many derive satisfaction from helping the environment, this only represents 25% of those surveyed. In recent years, extensive efforts to reduce physical hardware through server consolidation and virtualization have helped reduce some of those costs and must be acknowledged as a step in the right direction. That does provide some relief however servers must be on at all times to provide services to end-users and customers. What may be even more shocking to learn is that there are numerous major datacenters operating around the globe that have yet to factor energy consumption into their budgets. Hardware has become more powerful and requires more cooling and space often offsetting any gains in efficiency. Workstations, on the other hand need only to be on when in use by the operator or for maintenance. NetWrix believes regardless of individual motivation, having a power management tool for enterprise workstations is not only a necessity but a responsible act to help the environment. The result of these beliefs is the NetWrix Workstation Power Saving Manager. This tool enforces automatic energy conservation by forcing workstations into power saving mode during non-business hours. Workstations can be woken up when needed by the operator or for maintenance by IT. Doing so can realize a savings of up to 30% on energy costs associated with workstations, or, about $50 per machine, per year. We are doing our part to both help organizations save money and reduce greenhouse-gas emissions by offering this product for free. What has your organization done lately to reduce costs or help protect the environment? Have you implemented energy saving measures and how much has that saved your organization? Please feel free to share your thoughts below.